Creating Life in Colour: Straight into July Challenges!!! 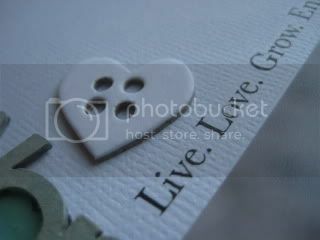 I had a lovely night out scrapping last night with Elana at Scrapbooks Etc. in Underwood, and as a result i've already done 2 blog challenges for July!! Been a while since i've done challenges on the first of the month!!! 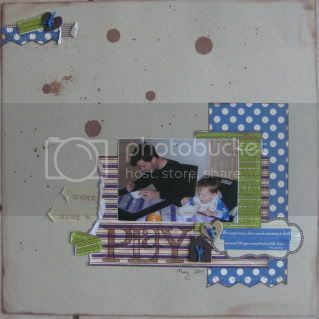 I've used a bit of a mix of things on this LO - stamps by Tim Holtz, Heidi Swapp, Maya Road and Stampin' Up. The little chippies i've used are so cute aren't they? It's from a Maya Road pack i bought last weekend that i have used almost constantly since!!! I've used them on the next LO too. 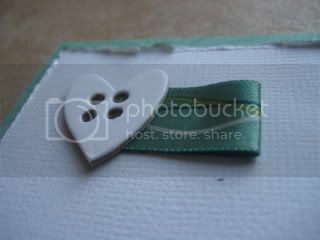 PP's are a mix of a few things including the new October Afternoon 5 & Dime range which is soooo cute!!! And of course a bit of glimmer mist for the splodging!! Love this photo - of my boys eating weetbix together at breakfast time - hence the title "Work, Rest & Play"
The second challenge i did last night was for the White plus One blog. 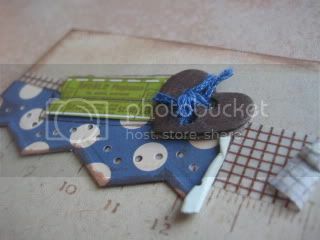 Their challenge this month is to use White + Aqua/Teal + Chipboard. 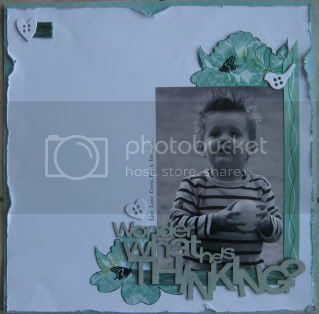 This gave me a great opportunity to use a chipboard title that i've had in my stash for a while "Wonder What He's Thinking". It's the second time i've scrapped this photo, because it's so gorgeous!!!! I mostly stuck with one of Kaisercraft's newer ranges "Chapter One" for this LO, but added in some Maya Road chippies and some ribbon. I got the lovely effect on the title by first painting it cream, then misting with silver plus a teal colour - i didn't have the exact right colour i wanted in the mist, so i had to improvise a bit and i couldn't be happier with the result!!! So soft and lovely!!! We've got a busy weekend ahead of us - we're painting Calvin's new room finally!!! Hopefully we'll be able to finish off this week and then move him in within a couple of weeks - it's getting pretty close now. I'm 31 weeks, but you just never know where God is going to direct your path!!! Have a great weekend all!! I love your layout...amazing photo! !So cute!! Lovely Page Kylie. The photos is adorable and I really like your element choices as well. Well done for finishing this one already. Wonderful pages! 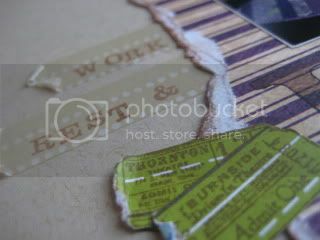 I love the tape you used and the tickets are great.